TigerText provides healthcare organizations with a proven, cost-effective way to solve the communication workflow challenges that routinely occur between physicians, nurses, support staff, and the multitude of systems that they rely on to deliver quality care to patients. These workflow challenges can result in longer patient stays, costly medical errors, under utilized capital, redundancies in labor, as well as dissatisfaction amongst staff and patients. Tiger Text addresses these challenges head on. 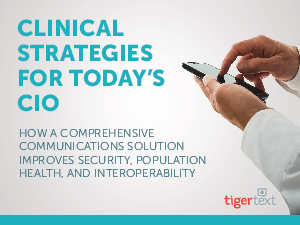 Since defining the secure messaging market in healthcare, TigerText has evolved into a fully integrated, clinical communications platform. With its comprehensive solution and clinical expertise, the company provides an innovative yet easy-to-use product experience, best practices implementation solutions, success services, and integration with your hospital IT systems. TigerText is cloud-based and suitable for a 10-user private practice or a 10,000-user healthcare system, delivering a high return on investment for any size healthcare organization.